So today, in continuance of my ongoing effort to rip Facebook account related stuff away from Ape Apps, I have finally replaced the Ape Market commenting system with a custom Ape Apps commenting system. I didn't carry the old comments over, but that's ok. The new system uses your same Ape Apps Account information as everywhere else, and if you are logged in to this website here, then you will automatically be logged in there too. 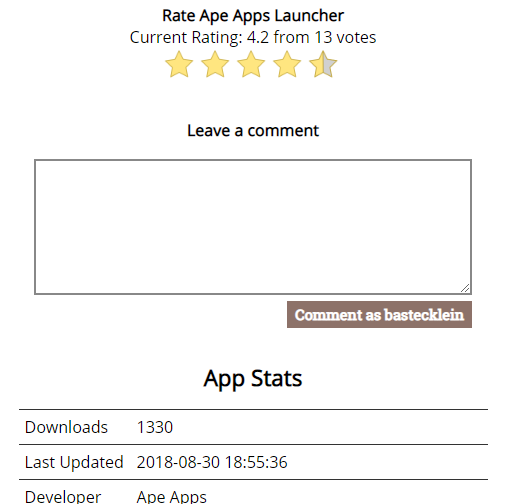 I plan to tie the same comments base into the Ape Apps Launcher at some point, so that Launcher users can see ratings and reviews of games before installing them. Throughout the last year, I have been slowly removing all things Facebook from Ape Apps, due to their abysmal track record on user data and privacy. For those concerned about privacy related to their Ape Apps Account, you should know that Ape Apps does not store any information beyond your email address and birthday (if entered when you created your account). The birthday is required by law in some countries because users under the age of 13 are not supposed to interact online without parental permission.